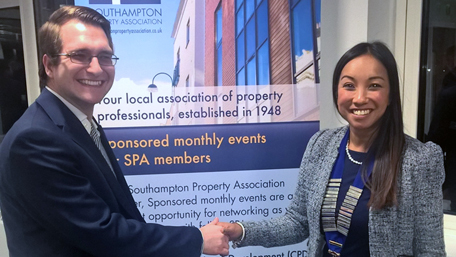 Congratulations to our Property Tax Surveyor Ian Barwick on being elected onto the committee of the Southampton Property Association (SPA) at their 2017 Annual General Meeting on Thursday 19th January. This was the 70th AGM of the SPA; held at the White Building, Southampton. The SPA is a membership organisation for those whose business affairs are substantially property related; within Southampton and the wider Hampshire and South Coast area. In addition to regular networking events, the SPA also delivers CPD and supports charities within the local area, through sporting events and gala dinners. “I’ve been involved with the SPA for the last 3 years, since joining E3 Consulting. It’s a great way to get to know other people in the local area within the property industry and I’ve had the opportunity to meet lots of friendly and helpful contacts. By joining the committee, I am keen to build my relationship with the committee and other members within the SPA; supporting me to further develop my transferable skills. I also hope to bring a different and fresh perspective to the committee, both as someone who is relatively young (and on the route to becoming a chartered surveyor) and coming from a niche, SME business, like E3 Consulting. I look forward to getting more involved with the committee and supporting with the continued delivery of good quality networking opportunities, CPD and charitable events.” says Ian Barwick, Property Tax Surveyor at E3 Consulting.